Being a software developer is challenging. But rewarding at the same time and we should be grateful for that. But how do we conciliate all the challenges we face? For example, it's probable that you feel pressured with deadlines, education, your own professional development, keeping up with many new technologies. Not to mention social skills. Since most of us we spend most of the time in front of a computer, are we socializing enough with our co-workers, friends and family? 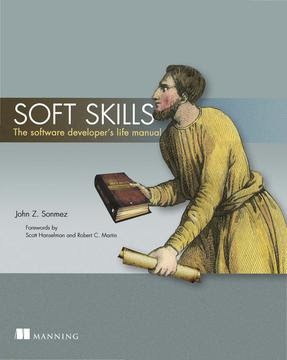 If you like me, have questions about all of that, I'd like to recommend the book Soft Skills: The software developer's life manual where John Z. Sonmez, author of the blog simpleprogrammer.com, guides us on this excellent book throughout these topics. Be sure that this book has insights for everyone. Personally, as an eager to learn person, I really loved his 10-step to learn process. I don't want spoil but it's an interesting technique to learn quickly and start producing faster than ever. Hope you enjoy the book as I did!